In recent years, the Olympic Decathlon may have lost some of its media stature to other high-profile individual and team events. 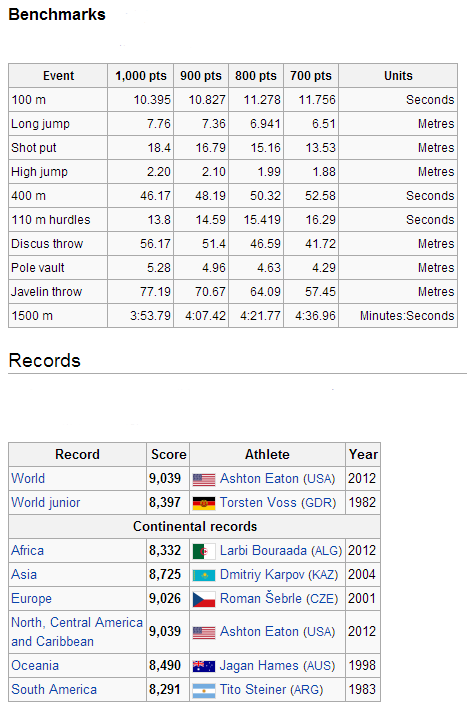 However, the claim that the Decathlon identifies the “World’s Greatest Athlete” is hard to deny. The two-day event is a true test of athletic strength, endurance, and speed. In order to be competitive in the event, the decathlete must train with specific focus and ultimately be “really, really good” at ten different athletic events. The Decathlon has evolved over the last century along with its scoring methodology. 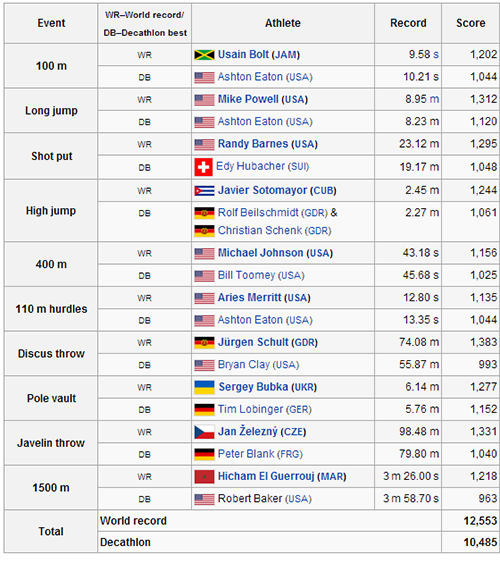 The competition is an amalgamation of individual events – and the first table below lists these events along with the current best score for both the individual athlete and the decathlete (“scores” for individual World Record holders have been calculated based on the current Decathlon scoring system). Decathletes do not hold world records in any of the individual events. World record holders in individual events do not compete (or…they are not competitive) in the Decathlon. Does the “medal-winning” CFO need to evaluate business opportunities with the mindset of the decathlete or the individual specialist? The scoring model in the Decathlon is a complicated and evolving system. What is essential to understand is that the events are not scored with equal math. In fact, each event of the competition has a practical maximum and is scored on a “curve” that has diminishing returns. The decathlete must account for the scoring system with the understanding that incremental performance gains in individual events are not rewarded with the same points, e.g. a one second increase in performance in the 1500 meter race does not produce as many points as a one second increase in the 400 meter race. Competitive decathletes must perform at a high level in several of the events, i.e. winning a single event with a great score may not be enough to defeat an athlete that comes in second place in several events – this is the essence of the Decathlon. Given that the individual events require such disparate skill sets, how do decathletes train? The decathlete’s objective is to attain the highest point total in a system that has competing interests and diminishing returns. A medal winning competitor from the Olympics described his strategy…a mindset that might translate well to business strategy. His training plan was essentially an exercise in evaluating the return vs. the required effort to gain additional points in each individual event. His winning strategy was to place his highest training priority on the events in which his largest gains could be made. From a “total points” perspective, it may be best to allocate the effort in areas that provide the largest potential for incremental gain. It may take a distracting amount of effort – compared to the incremental return – to become better at an event that you are already really good at. Whether you are in the public or private sector, the scoring system in the Decathlon may provide a compelling parallel as you evaluate the ROI on various initiatives. In most areas of finance, the reality of diminishing returns is an issue that should be carefully analyzed. You may be in a business where setting the World Record in an individual event is the only focus. However, in most situations, the CFO needs to be “really, really good” in several disciplines of finance. If you look at your business as a series of events that aggregate into an overall score – you can focus your “training” for each event based on the potential impact on your overall score. Projects utilizing analytics can be evaluated from this same incremental ROI perspective. What are the areas in your business in which analytics has the potential to add the most amount of incremental value? Are you currently investing an inordinate amount of effort in an area which you are already really good at – achieving positive returns, but on a diminishing basis? Are you evaluating your business from a “total points” perspective? You may win a Gold Medal by setting a World Record in an individual event, but if you are in a “total points” business, the training mentality of the Decathlete may serve you well.